The Independent has published three charts that they claimed showed why British politics is so interesting at the moment (how very Buzzfeed). It is noteworthy that the SNP, a party attracting most of its support from Scotland – with a population of less than 6 million are towering above the Lib Dems and UKIP combined! Impressive. 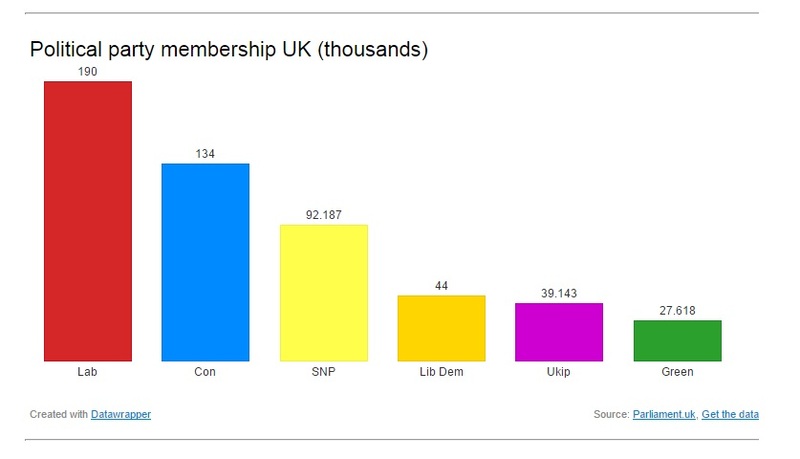 This makes the Green Party membership comparable to that of UKIP. 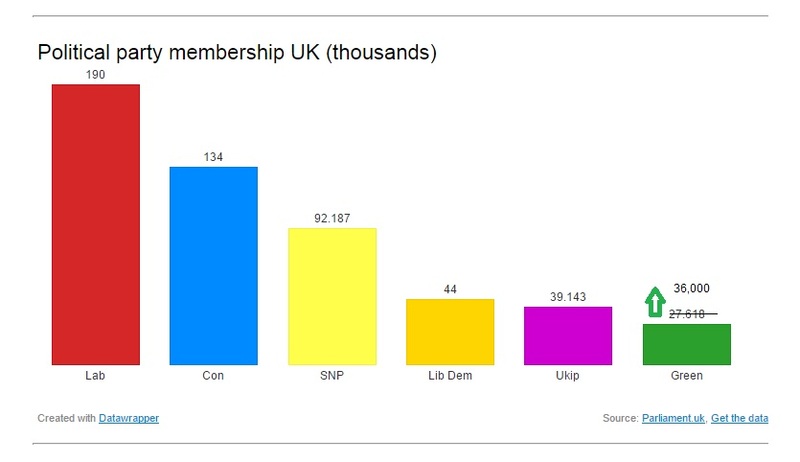 The Green’s membership however is growing about three times as fast in 2014 than UKIP suggesting that these positions will soon be reversed. Read more on party political membership here. 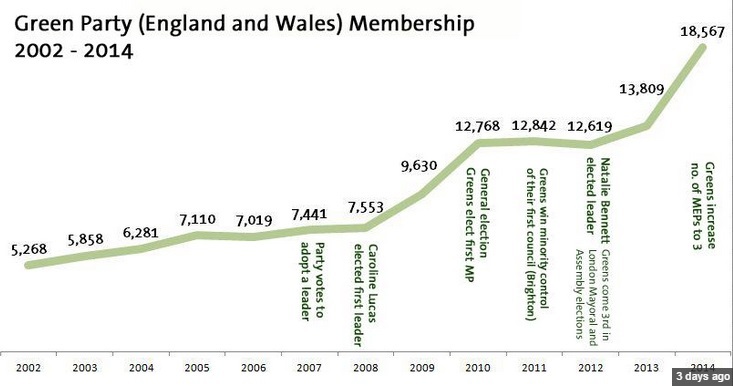 Today, Derek Wall from the Green Party tweeted this graph showing the growth in Green Party Membership from 2002 – 2014. How low the membership was 10 years ago (I joined when the party had just 6,280 other members). 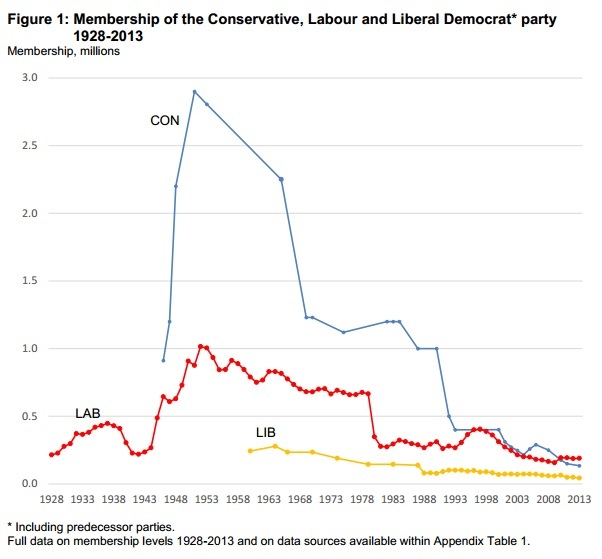 How consistently the membership has grown over the last 12 years (with obvious spikes). Now the membership is consistently slipping away. 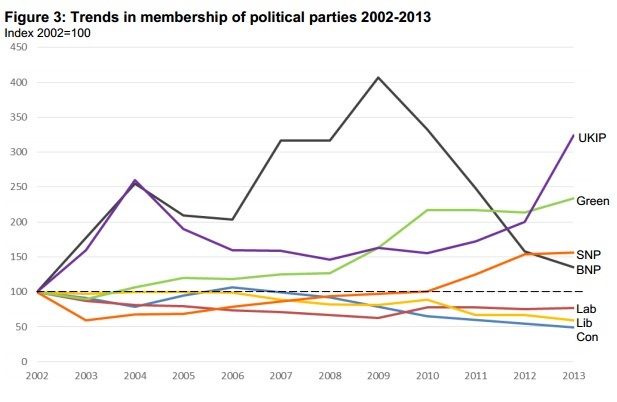 For the sake of comparison, if we look at the Conservatives compared to the Greens we can see that the Tory membership fell by more than half between 2000 and 2013 while the Green Party grew by three fold. 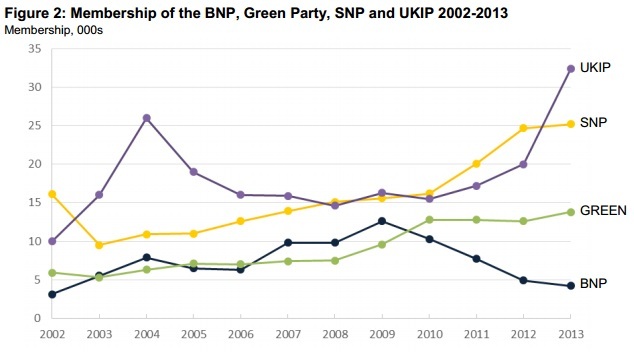 It is worth highlighting though that other smaller parties are also seeing a growth (the BNP serving as the exception). This one crass measure doesn’t tell you much but it does suggest that both UKIP and Greens are currently riding high. The pertinent question though is will this trend continue and will all these small parties become bigger players in British politics or will we see some of them drop off like we did the BNP?